Cerro de Pasco (population 70,000) is a city in central Peru. It is the capital of the Pasco region, and an important mining center. 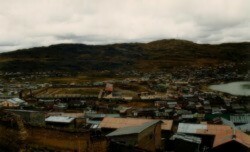 At 13,973 feet (4,380m) elevation in the Andes, it is the highest city in the world. It became one of the world's richest silver producing areas after silver was discovered there in the early 1600s. Although the silver was exhausted by the Spanish, it is still an active mining center. It is currently noted more for copper production but the mines in the area also produce gold, lead, bismuth, and zinc. Enjoy your Holidays peru with us, is the perfect choice to bring your whole family and have a great time!